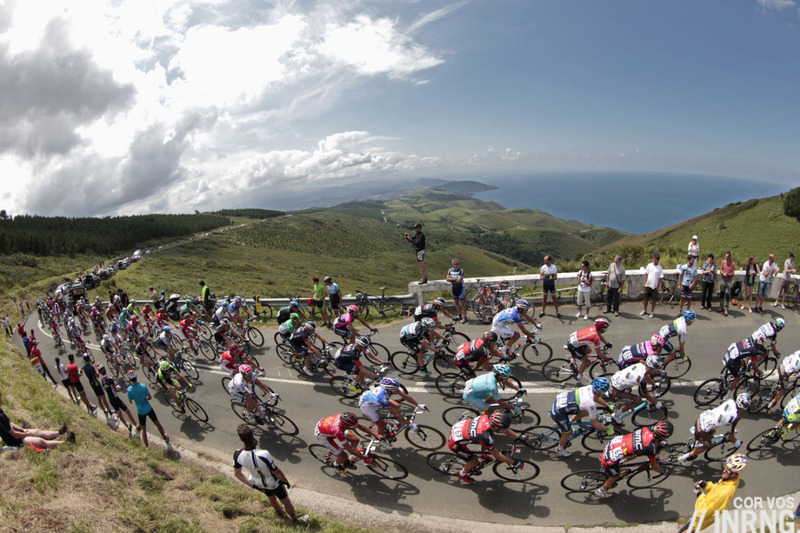 The high point of the Clásica San Sebastián, the Jaizkibel is a mountain at the very end of the Pyrenees and the start of the Basque Country, a hot bed of pro cycling that has produced many champions, teams and sponsors. The Route: there are two sides, this is the western ascent as used at moment by the Clasicà San Sebastian race. The GI-3440 starts between Lezo and Pasai Donibane. 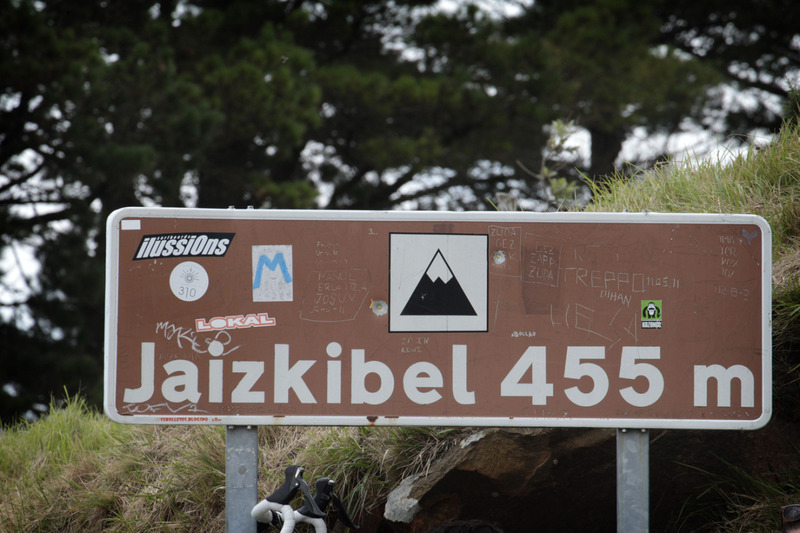 Look for the Jaizkibel sign and the turning on the right. It is 8km long at an average gradient of 5.6%. The profile above says 475m but the sign at the top says 455m. The Feel: geologically this might be the Pyrenees but the port gives the start an industrial feel and the smell of the sea is different too. You turn your back on the port to start climbing and immediately the road rises. It’s a wide road with a good surface. It’s steepest at the start with 9-10% slopes and some hairpins marked by grinds from motorcycle footpegs. The Basque Country is big on cycling but this climb has more motorcyclists than cyclists. It’s still quiet, the road leads up the mountain and back down the other side so it’s for of daytrippers. Cycling’s psychogeography means Belgium is presented as a wintry place where a weak sun serves only to illuminate shades of brown in the muddy fields. Similarly April’s Tour of the Basque Country sees this region associated with pouring rain. But in summer it’s typically dry and warm and by summer the oak and chestnut trees by the road are looking tired. Once you leave the woodland you get the views of the sea. There are only a handful of pro races with ocean views and this has to be one of the best given the elevation and the purity of the view, just meadows, cliffs and breaking waves. The upper part is exposed with heather, ferns and grassland. It’s tempting to imagine Atlantic storms blasting the mountain making it impossible for vegetation to hold on but the lack of plants is probably just human influence helped by the Betizu cows than roam on the mountain. As race venues go this is a difficult climb to judge. It’s not hard, a second or third category kind of climb if you like your labels. But after 200km it’s ruinous for the lone rider because the softer slopes suit a peloton and team leaders can sit tight on the wheels of their helpers but those hoping to win need to be at the front because if they’re too far back and a rider pops then closing the gap to the next wheel can be hard, especially if there’s a crosswind over the top. History: the Clásica de San Sebastián has been going since 1981 and the Jaizkibel has been integral to the race. Why? Because it’s there, the mountain sits above the city of San Sebastián and makes a natural choice for the route and also a strategic moment. 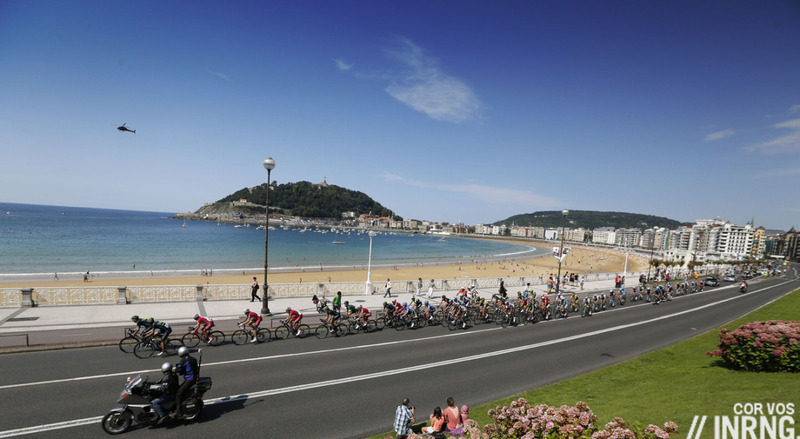 However in recent years the Jaizkibel has been moved, it remains a fixture of the race but is no longer the ultimate climb before a quick descent into San Sebastián and the finish line. As it’s not the hardest climb it was not proving selective enough and now they’ve added more climbs. 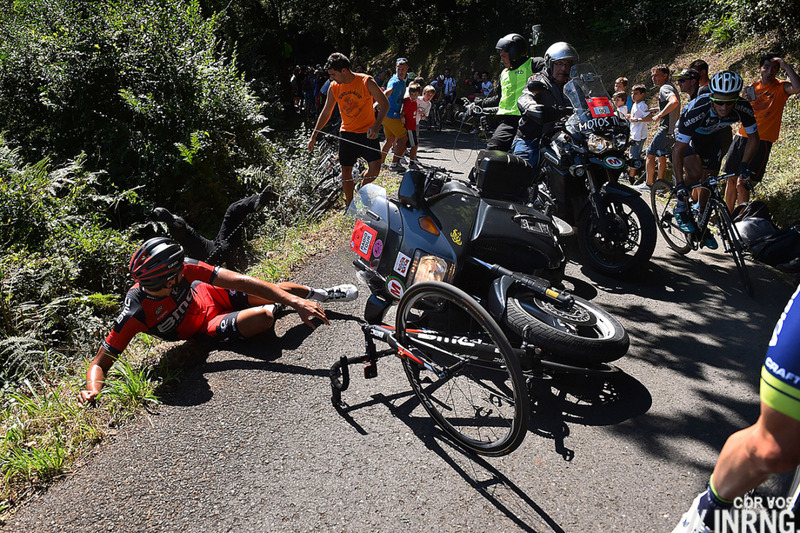 This year’s route has the climb of Murgil, similar in difficulty to the Bordako Tontorra but wider and safer, the idea being that there’s room for vehicles to pass riders and so lessens the chance of a repeat of Greg Van Avermaet being flattened by a motorbike. The Jaizkibel is a regular before one of the best finish lines in the sport next to the Playa de la Concha, the large sweeping bay. Name: supposedly from haitz gibel or behind the rock in Basque. The Basque language has puzzled linguists for years because it has few roots in other languages. Basque is widely spoken and many larger towns and cities have two names so San Sebastián is Donostia in Basque. Basque Cycling: If you want to know where cycle sport is popular just look at teams and manufacturers. There’s the Topsport Vlaanderen team in Belgium, the Bretagne in Bretagne-Séché Environnement gave the game away last year and in recent years we’ve had the Euskadi team. When a region has its own pro cycling team you know the sport matters to locals. 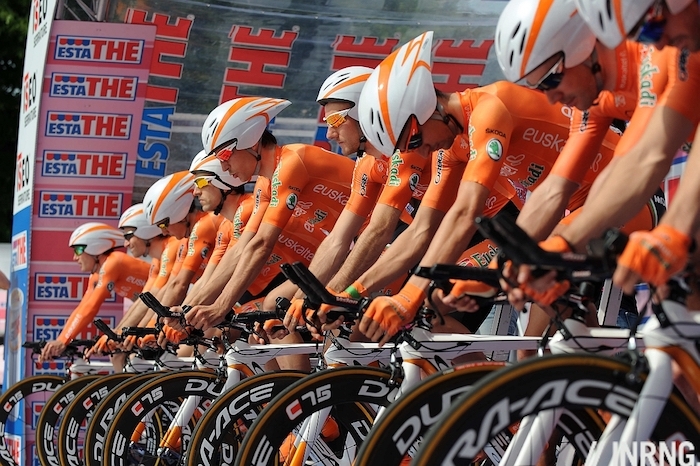 The orange-clad Euskadi team were a special team, rarely victorious but invariably lively especially when the road went upwards. That said a spin up the Jaizkibel doesn’t mean meeting lots of local riders. The real heart of Basque cycling is further inland in places like Durango, Eibar, Zumarraga and Arrasate to name just a few towns and the twisting, steep climbs are packed with cyclists on a Sunday morning. If you visit for the Jaizkibel, stay for these roads. Some locals will be on Orbea and BH bikes, two local firms that started out as arms manufacturers and found the steel tubing for a gun barrel similar to a frame tube and the rest is history. Travel and Access: Bilbao is the nearest international airport with shorthaul connections to Europe. It’s just next to the French border and there is a TGV express service from Paris to Irun on the border, right to the foot of the Jaizkibel although the high speed train slows considerably for the last section of the journey through France. If the TV coverage is back to normal – the relay aircraft developed a serious fault last year – then it’s a good race and interesting ahead of the Olympics too. So it was indeed. Glad to see Mollema back after his last Tour defeat. Thanks for the link, enjoyed that, He rode up the other side from Hondarribia. There is also a road to the top of the mountain just before the road summit on the left which is pretty steep and a nice little extra test. it gives nearly another 100 m of vertical climbing and access to great views. High quality top-ten, but this race needs a little reengineering, too… it’s quite similar to the Lombardia when the finish line was in Lecco: an historical climb way too far from the finale, a lot of flat kms between the ascents, all the thrill reduced to 5′ on the last slope + some 7-8 more minutes descending towards the last flat km or so. A really exciting final quarter of hour, but it’s pretty much impossible to see anything meaningful before that. Excellent summary. The small airport at Biarritz makes for a good entryway, too. Biarritz is much more accessible for this climb and region and San Sebastian has a local airport right at the foot of the mountain which is still expanding and can now be reached from for example Luton UK. I happen to know this climb very well and it’s a shame you didn’t ride up on the eastern side as I find this actually harder, more attractive and varied, with more places to stop and enjoy the local food and drink, culture and views. There are also many quiet tracks on the mountain to enjoy, many of them with excellent paved surfaces. As a gateway to the western Pyrenees, I can thoroughly recommend the area as there is good cycling to be found on both the French and Spanish sides of the border and the Basque hospitality and cuisine is outstanding. There are many very accessible climbs of a less strenuous nature, and the bigger climbs are only a days ride or so away. The Eastern side of the mountain is very cycling orientated with good cycling routes and facilities. The proximity to the French border makes for a very cosmopolitan atmosphere in the summer, yet with few tourists from further afield it maintains very much a Basque feel. Jaizkibel is not hard per se, but I can’t imagine how it might be with rain and wind. The top looks very exposed. There is also this curious feeling to be in the mountain while seeing the ocean. And having a quite big town as Donostia just there below.